Booking the condo was a breeze as was check-in. The Resortica rep I spoke to on the phone was able to confirm that our unit had a set of decent golf clubs and boogie boards, both of which were actually there when we checked in. Loved B-22! So much in fact that we're already planning another trip later this year. The condo had EVERTHING, down to beach chairs, snorkel gear, golf clubs, and boogie boards. The built-in Viking grill was great, easy to use and easy to clean up. Our only real frustration was being charged for a port-a-crib when we found one on the property that we could have used free of charge. MANAGEMENT RESPONSE; We apologize for that incident. If I recall right, your account was credited once you brought this to our attention. Sometimes a unit acquires inventory that we are not aware and it is not placed in the inventory list. Contact all online. Great information and attention was given to make our reservations, payment, and other procedures result in an efficient rental process. We had a wonderful, carefree stay. Beautiful condo with great view and nice amenities in the kitchen. Eating papaya with our breakfast and coffee on the lanai every morning was a heavenly way to start the day! We hope to do this again next year! My husband and I have been visiting the Hawaiian Islands for over 20 years. We usually visit once or twice a year. We have stayed in high end hotels; Fairmont Orchid & Mauni Lani Resort as well as most of the condo units at Waikoloa Resort. This condo is our new favorite! The location is exceptional! The one of the pools & jaccuzzi is across from the unit. The Queen's Shopping mall is right across the street from the entrance into the Beach Villas. The King's shopping mall is a little farther but an easy stroll. Golfing is literally out the back door! The patio has a wonderful, built in, deluxe barbecue grill. The Resortica staff members were always a phone call a way, when needed. The kitchen is well equipped, we even used the crockpot for a meal, while we were out all day! The garage is very handy on those times you might venture out to Costco. A few steps and you are in the condo. Not condos units come with a garage. We have had to wait and wait at other units just trying to find a nearby parking space. Those are only some of the reasons we were so pleased with our stay. The owners are especially accommodating! We HIGHLY recommend this rental property! Anne Marie was always helpful and replied promptly to my emails and phone calls. She has true aloha spirit! This was a memorable holiday from beginning to end! Every moment in the villa felt Hawaiian because of the luxurious and thoughtful decor. The beds were awesome! The kitchen was a gourmet's dream. The location was perfect for walking to enjoy the resort's amenities such as shopping, dining and walking. 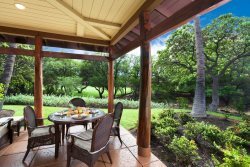 The location of Waikoloa is perfect for great weather and easy access to great beaches and activities. Mahalo! Wendy was awesome. Alicia did not follow through on the propane issue. Kim did. Everything in this home was so PERFECT for our family. We love the layout of this property in and out and all the furniture in this house was just right for our family and not overdone. The pool was perfect for our grandchildren ages 4,5,6 yrs old and grocery shopping, dining, etc nearby the property was extremely convenient. Everything went very smoothly and responses to my emails were always very prompt. We had a wonderful stay. We have stayed in many different units in the Waikoloa Beach Villas. We like the location of this particular condo and would consider staying again. Mahalo!